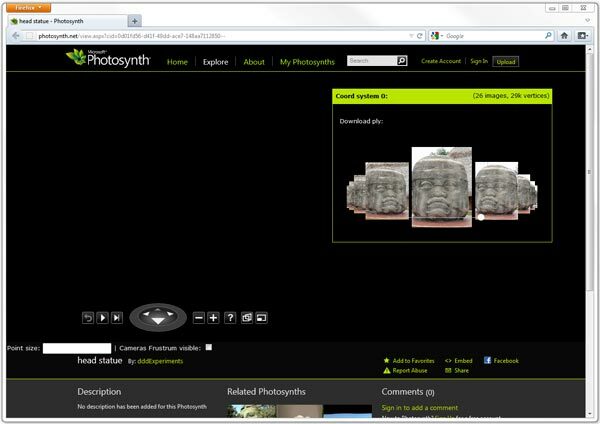 I’ve updated my PhotoSynth extension for Google Chrome. I’ve included all optimization described in my previous post: point cloud loading is 4x faster and ply file generation could be 17x faster in some cases . 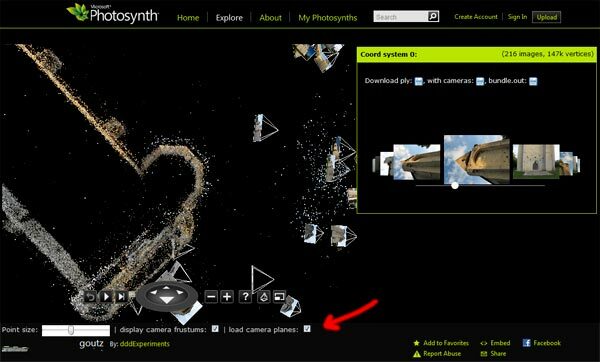 As you can see in the screenshot below, I’ve also added a new checkbox to let you choose if you want to load thumbnails or not in the WebGL context (which could take a while for synth with more than 200 pictures). To accelerate bundle.out file generation I’ve found a solution working pretty well for very large ascii file (80mo+). I’m generating the ascii file by writing directly in binary in a Uint8Array (by chunk of 1mo). The resulting code is more complex but is as fast as regular string concatenation and in comparison as a memory footprint very limited. It’s not integrated in the extension yet as my test case is working well (ascii ply generation) but bundle.out is slow (I need to track V8 bailout/deopt to understand why it’s slow). I’ve recently discover the new transferable object feature in Google chrome. BTW transferable objects are really great! Furthermore you really should use them as I’ve found that structure cloning is leaking (you can try this leaking demo with chrome 17). Thus I’ve started to update my extension and done a benchmark of various solution with a big synth of 20mo (1200k vertices and 1000 pictures). I’ve also improved a lot my binary parsing by using only native binary parsing (DataView). One thing about DataView: did they realize that if you forgot the endianness parameter it will use BigEndian? (littleEndian = x86, bigEndian = Motora 68k). I’m using transferable objects to both send the xhr.response (ArrayBuffer) and receive the parsed Float32Array (vertex positions) and Uint8Array (vertex colors). Issue: I didn’t manage to spawn a worker from my extension directly (SECURITY_ERR: DOM Exception 18): I’ve been forced to inline the worker as a workaround. Issue: because of this bug workers can not do cross-orign xhr. I’ve also optimized the PLY file generation by generating binary file on the client side instead of ascii. Sadly I didn’t manage to find a way to accelerate “bundle.out” ascii file generation yet (involving lot of string concatenation and numbers formatting). I didn’t have updated the extension on the chrome web store yet as I’m working on using the new BufferGeometry of Three.js that should be more efficient. Building BufferGeometry directly from Float32Array (vertex positions array) and Uint8Array (vertex colors array) seems a really better solution IMO. I’ve also discover the webgl-loader mesh compression solution recently. I’ve compiled my own version of objcompress.cc and fixed the JSON export. Then I’ve created my own format allowing to pack in one file all the utf8 files (thus reducing the number of http request needed). I will post about it soon: stay tuned! On a side note I’ve also been playing with the new mozilla add-on builder SDK… well IMO Firefox isn’t the best browser for extension anymore. I’ve been very disappointed by the restriction applied to code running in the contentscript (for example prototype.js is not working: I had to use a clone that I’ve built long time ago). And I’m also very concerned about their security strategy: they don’t have a cross-orign xhr permissions field in the manifest. Thus extensions can do cross-orign request to all domains by default! Nevertheless I’ve managed to port the binary parsing of the point cloud but Three.js is not working either .